Hi. im Swedish guy with early dreams of VR since i first tried the "Virtuality" arcade machine "Nightmare" later called "Dactyl Nightmare". My goal is to bring my childhood dream back from the dead, for the historic value and because it was a lot of peoples first VR experience! I have gain the original Programer and graphic designers blessing to recreate the game. but have failed to reach the actual owner of the Game. The game will be Free of charge and should NOT be redistributed without my knowledge. Everything is built from scratch and is measured by eye sight from this lone clip! all 3D work is made in sketchup and all sound effects are taken from the original videoclip. Nice one! It's about time someone did this! This was awesome! Brings back memories. I'm surprised it took this long to appear on the Rift. Got a game in development or a cool piece of VR tech you want to show off? We are looking for demos, trailers and all things VR. Just send us a mail and we would be more than happy to feature it on our site. thanks i really appreciate you guys like it! Many of my solutions to the engineering, like parenting the player while on the flying pods, with a parenting script and a animated "seatbelt" cube is not pro work, but works for the demo. The extreamly crappy animated Dactyl is shootable (soundFX) and quite hard to hit. If anyone with skills like to help me out geting this into multiplayer and more like the original. send me a mail! Long live the "Virtuality Arcade"
This is great! I've been wanting to do the same thing but just don't have the time. Keep it up! HAHA! aww Good job man. Cut a couple of holes in a piece of black paper and stick it on your Rifts screen and you can get the original Virtuality FOV and resolution on all games without any programming. Absolutely amazing! Loved every bit of it. thanx everyone! Love giving your lost VR youth memorys a revival! If someone know how to change the Unity OVRplayer scripts to actualy shrink the FOV to 60, crippling the Oculus real fov. please let me know. The only thing i can change is the virtual fov and not the real displayed fov. Yeah, it was in stereo. If necessary you could just put a black border around the screen to achieve the required effect. I dont know what to say. i am so happy and overwhelmed by all reactions to the simple demo!!! Actually that's not correct none of the Virtuality machines ran in stereo. The 2000 series had that capability but all games had 100% overlap on the Left and Right eyes. The worlds were true 3D, which was very impressive for the time especially as they were real-time. I owned 2 x 1000SD machines and a 2000 Duo, and used them for corporate entertainment and exhibitions in the UK. There was another company that rented out the 1000CS machines and we used to play each others machines when we were at the same shows, so I've played DM 100's of times. I stood on the moving platforms and they worked fine. The flying Dactyl looked just like the original and I managed to shoot it after a few goes. That game isn't far off, just a few bits and bobs to sort like the player body, the IK and obviously another player to shoot at. I hope you enjoy. 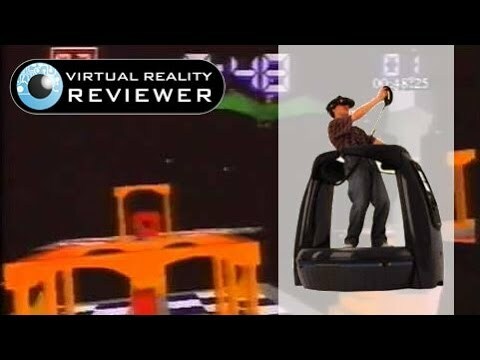 Please leave comments here http://www.virtualrealityreviewer.com/dactyl-nightmare-90s-virtual-reality-oculus-rift/ it will help us out a lot with google ranking. Im absolutely stunned that my simple work would be appreciated and acknowledged by the community!? Best regards / "Now i definitely will work on this demo"
The Dactyl in the original Virtuality game swooped down after a preset number of shots had been fired (10 or 12 iirc) so I doubt this demo has that trigger set. If you ever find yourself in Leicester then make sure you visit the Retro Computer Museum http://www.retrocomputermuseum.co.uk/ as they have what is likely to be the only running CS1000 anywhere. Thanks for your comments and the tip. I would love to get to the Retro Computer Museum some day but im not sure my kids would enjoy it as much as I would. SputnikKaputtnik thanx! Sadly the answer i no. I have not made any contact with some skilled Unity developer as i hoped for, but as this is my only contribute to the rift scen, i will do what i can to progress my own knoledge to make this game solid. starting with a AI to actualy shot and destroy. thanx to WhelanWeb http://www.virtualrealityreviewer.com/ there still be a chance this demo will make it into a reality for us senior VR lovers. Will you release the 0.4 compatible version soon? I have 4 original VR machines from the 1990`s. I will restore them all! EVERYONE who has tried an Oc Rift, had bad expectations of the 23 year old machines... but ALL said WOW, its better than a rift!!! I tried my first Rift (DK1) a couple of weeks ago, and I`ll be honest.. yeah the GFX are better (due to screen res and PC), but the tracking is not up to the original VR machines quality - imho. Ok Back to Dactly Nightmare.. The Dactly, on my game, comes down after 8 shots made by the player - with the voice over `Bird is coming`, whether a hit of not. A warning after 7 shots of `Bird is Hungry`. The qty of hits before the dactly attacks can be set in the start up sequence of the game though, so I`m guess it was up to the operating company. Also, falling off the map... not possible by default, but the `invisible walls` can be turned off too. Sorry V8Griff.... You are kind of `wrong` about the VR 1000 units being non Stereo..
Just 2 games ever were. One `WAS` Dactly Nightmare`, and I think the other was Exorex. All the other games were not stereo, but these two did actually send a different POV image to each eye.. It looks good, and the map looks very accurate..
Where did you get this from ? - just the Youtube videos? I look forward to playing.... tho tbh I dont have a Rift, so I hope I can still play this on my PC! ? PS: thanks V8Griff! for mentioning the Retro Computer Museum, in Leicester, UK!! Yes thats where one of my VR machines is - well along with the dead CS and the problematic SD units too. the other working machine is in my garage. Both will be at the Play Expo Event in Manchester UK, in October - Playing Dactly Nightmare Multi-Player!